left to right: Corey M., Gillian C., Chris T., Monica C., Tina A, Shamim A. A multidisciplinary team of University of Toronto graduate students placed second and received the Participants’ Choice Award after competing against 23 teams from international institutions at the 2017 Emory Global Health Case Competition on March 25, 2017. The student team consisted of six graduate students from the Dalla Lana School of Public Health, the Rotman School of Management and the Faculty of Law who presented their case: ProVision: Addressing Adolescents’ Mental Health Needs in Monrovia, Liberia. “The competition sounded like a great opportunity to look at a global health problem through an interdisciplinary perspective, and I was hopeful that I would learn valuable skills outside of a public health framework from my teammates,” said Corey McAuliffe, a third year Social and Behavioural Health Sciences PhD student, reflecting on why she decided to enter the competition and lead the team. The team was additionally comprised of: Shamim Ahmed (first year PhD – Social and Behavioural Health Sciences), Tina-Marie Assi (second year MBA at Rotman School of Management), Gillian Cook (second year JD/MBA at the Faculty of Law and Rotman School of Management), Mónica Rosas Calderón (first year MBA at Rotman School of Management), and Christopher Tait (third-year PhD – Epidemiology). “Our Rotman team members helped the public health students to understand design thinking, which was incredibly influential to our process and final intervention,” said McAuliffe. Assi said the group’s presentation style and approach to the problem may have helped them secure the runner-up position. “I suspect what made our presentation stand out was our use of storytelling and a user-centric design process, which came out in our slides and delivery,” she said. 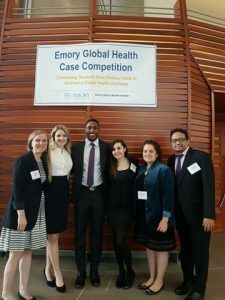 Every spring, Emory University hosts 24 teams from universities across the globe for five days during which each team develops a solution for a global health case, competes for cash prizes, and networks with each other and expert judges. The team developed a four-pronged strategy to reduce stigmatization of mental illness and special needs (e.g. physical and mental disorders) among adolescents in Monrovia, Liberia by focusing on education, mental health literacy, and increasing the pathways to health care. It combined radio programming, a mental health telephone helpline, community events, and listening groups to deliver mental health education, address isolation, as well as promote social cohesion and youth empowerment. “It was extraordinary to watch the students come together as a team — I have never seen a group model the ideals of multidisciplinary collaboration so well,” said Uttam Bajwa, a post-doctoral fellow in DLSPH’s Office of Global Public Health Education and Training, who served as the team’s mentor. Bajwa supported the team in Atlanta during their case presentation and what set the group apart, she said, was how their model was evidence-based, involved rich community consultation, and demonstrated sensitivity to power, politics, and privilege in global health work, especially the need for meaningful, mutually beneficial partnerships. “My congratulations to our outstanding case competition team for developing a compelling evidence-based solution to a wicked global health problem,” said Erica Di Ruggiero, Director of the Office of Global Public Health Education and Training. Shamim is a first year PhD student in Social and Behavioural Health Sciences at the Dalla Lana School of Public Health with experience in policy, advocacy, and communication. Prior to coming to the DLSPH, Shamim worked in the health and development sector in Bangladesh for almost 9 years. He also has an MPH from James P Grant School of Public Health and Post Graduate Diploma at University of Amsterdam. Tina is a second year MBA student at Rotman School of Management with expertise in epidemiology, public policy, and health sector strategy. She has a PhD in Epidemiology from the University of Pittsburgh and substantial work experience in global health policy, financial and impact modelling, and impact financing for early stage ventures targeting frontier markets. Gillian is a joint JD/MBA student in Law and Business at the University of Toronto with an interest in global health policy, human rights frameworks, and healthcare delivery in the Global South. She has a Master of Health Science and an undergraduate degree in Biomechanical Engineering. Corey is a third year PhD student in Social and Behavioural Health Sciences at the Dalla Lana School of Public Health with an interest in the experience of trauma and distress due to global health research. She has an MPH from Emory University and substantial experience as an educator and global health practitioner. Monica is a first year MBA student at Rotman School of Management with clinical experience in underserved areas, quality improvement, health care innovation, and robotic surgery. She was a family physician and surgeon in Mexico and completed a postdoctoral fellowship in robotic surgery at Harvard Medical School. Chris is a third-year epidemiology PhD student at the Dalla Lana School of Public Health with an interest in applying epidemiologic methods to addressing the growing burden of non-communicable diseases in the global adolescent population. Chris has an MPH from the Mailman School of Public Health, Columbia University and experience organizing and participating in case competitions.